There was no panic in his voice, just urgency. Darryl Reynolds had walked over to the only remotely familiar face among those loitering on press row across from 'Nova's bench about an hour before a November road game in Charleston, S.C.
"Do they have hot water in the press room, like for coffee?" Villanova's center asked. Reynolds didn't want coffee. He had just finished a pregame workout with Villanova's other post players, taking a minute before the main warm-up for Western Michigan. Reynolds was looking for the water, hot. A couple of minutes later, in an area set aside for meals for those working at the game, a woman held a coffee pot full of water, getting ready to heat it. Had someone just come in asking for that? Was he a tall guy wearing a Villanova uniform? This might be a little window into how this man ended up in this position, starting at center for the nation's second-ranked team, beyond his 6-foot-8 frame, beyond rebounds and screens set. Hot water isn't a Villanova team thing. His coaches didn't even know Reynolds drank it, or that he had chased it down himself before a game. "I don't like cold water," Reynolds said recently. "It doesn't do it for me. It's actually proven that warm water is better for you." He's actually right. Among other benefits, it enhances blood circulation and relaxes muscles, more effectively than cold water. Reynolds had done his research since Villanova players are required to drink a lot of water to pass hydration tests. Reynolds found it hard to gulp cold water - "if you sip it slowly, you won't make it," Reynolds said of the hydration tests. "The warm water thing became a habit." During a game, Reynolds said, "I drink room-temperature water the entire time." No manager was scurrying around in Charleston trying to get Reynolds his hot water. They're aware of what he likes, but when it wasn't there for him Reynolds went to work. "They're busy in their own thing - they've got a million things going," Reynolds said. "I'm not a prima donna - force a manager to go out of their way to find me hot water." He did want the water, though. "I was chasing people down - 'You know where the press room is?' "
Leaving the Wells Fargo Center, getting on the bus, Josh Hart said to Reynolds, "You see the sign?" "They've got a sign - me, you and Kris." The bus started moving. Hart said, "Look, there it is." During much of this basketball season, there had been a big Villanova V hung over the side of the Wells Fargo Center, where Villanova had played four home games. 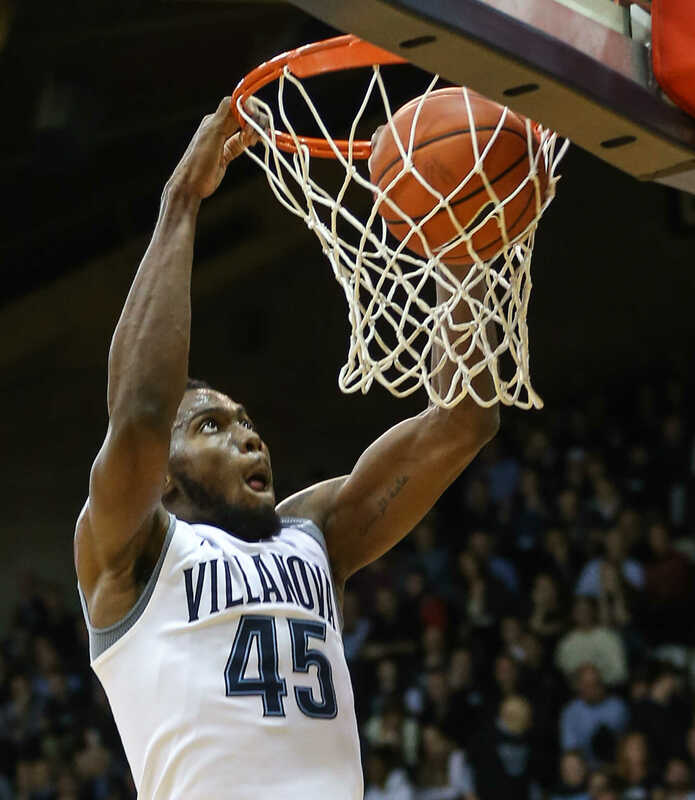 Later in the season, the V was replaced with another 40-foot by 40-foot mesh banner bearing the likeness of Reynolds, Hart and Kris Jenkins, Villanova's seniors, each easily identifiable from I-95. Before the next Wells Fargo game, Reynolds walked around to look at it. It had to represent something special for a Philly guy, someone who moved from West Oak Lane to Bala Cynwyd ("right by the Acme") in high school, whose parents grew up in Southwest Philadelphia. An awful lot of odds had to be beaten to end up on the side of that arena. As Villanova moves into the NCAA tournament as defending champion, Reynolds already has proven his importance, when he's in the game, and when he's out. His path, however, is unique. Jay Wright pointed around his practice gym the other day and said, "There's nobody else like him." Wright was referring to the journey, the type of prospect Reynolds had been, athletic but unpolished, how Villanova's coach himself initially didn't see the value in a big man who played high school ball just down the road at Lower Merion and even practiced occasionally inside Villanova's Pavilion. Going into Reynolds' senior year of high school, his best offer may have been from Division II Holy Family, and Reynolds took it seriously, seeing a scholarship for what it was, a free education. But he believed in himself all along, he said, and he wanted to shoot higher. A few Division I coaches began looking more seriously at him, offers came in from schools like Delaware and Hartford, but Reynolds already had decided to go to prep school in New England, to keep reaching higher. Now, Reynolds can tell you about the effort required of each step, how he got to Villanova as a defensive specialist and found out his reliable moves weren't stopping anybody in practice. Larger-than-life likeness on an arena? Who could imagine such a thing? He felt smaller than ever. Wright wasn't in the gym to see Reynolds. This was at Villanova's Pavilion, district final, Chester vs. Lower Merion, and Wright was really in his own gym to see Chester junior Rondae Hollis-Jefferson, who eventually chose Arizona and now is in the NBA. "That's the guy that I like," said the man sitting next to Wright, pointing to Reynolds. Since that man was Larry Brown, Wright made a mental note of it. "I personally am not good at identifying athletes that aren't skilled players yet and projecting - I'm not good at that," Wright said, noting that Brown is, and his own assistants are, but he remembers telling himself at the time that he should listen. "It really was the impetus," Wright said of the Reynolds recruiting. Reynolds already had committed to going to Worcester Academy in Massachusetts, and the next year Villanova assistant Baker Dunleavy made a trip up there to see him. "I just noticed how physically how good he looked," Dunleavy said. "He was intense and vocal. A lot of big guys tend to be quiet. His energy really struck me. Everything I saw was consistent with what Coach Downer said." Gregg Downer, coach at Lower Merion, remembers the first time he met Reynolds, "I thought he was a little bit unusual, so refined, and so genuine. I do remember telling Jay Wright, kind of at the 25th hour of his recruiting, 'We'll see what happens with the basketball. I can promise you, at minimum, you're getting an amazing human being." Markus Kennedy had left Villanova, ending up, coincidentally, with Larry Brown at SMU. Daniel Ochefu had arrived as a freshman, but there was a need for another post player. "There may have been a scholarship," Dunleavy's said of Kennedy's departure playing into it. "There may not have been that intense need." The way Reynolds looks at it, his whole career has been taking steps - "some of them slower than others obviously." Just getting to the stage where he could compete in practice as a freshman turned out to be a big step. "When I was able to get on the floor, that felt good," Reynolds said. "Getting on the floor and being a key component, that felt good. Starting this year, that felt good. You find the satisfaction and quickly wipe the slate, you're not satisfied. You realize there's so much more to be had." That first hurdle after his arrival may have been the highest. "I had to learn how to play a lot harder," Reynolds said. "In high school, I was bigger, I was always athletic. I had to learn to play a lot harder, a lot smarter. So many different things go into playing at this level. I had to learn how to become a lot better defender." This was a shock, since Reynolds was as good as any shot blocker in the state. "I get to college, I can't get anything," Reynolds said. "I'm like, 'Whoa' . . ."
Facing Daniel Ochefu was a game-changer, in that Reynolds no longer was the big man in the matchup. He'd played against bigger guys in high school. "But it was for a game," Reynolds said. "They had to wear you out for a game." Here it was a year, "and another year, and another year," Reynolds said. "I have to find out, how do I use my athleticism and my quickness to beat out a guy who had three inches on me? First things first, the height. And he was strong. You have to do your work before he gets the ball." It wasn't just Ochefu. Forward JayVaughn Pinkston, there for Reynolds' first two seasons, was offering his own lessons. "JP was one of the best, if not the best, at seeking out contact and making you pay for which way you were touching him," Reynolds said. "If you had a forearm on JP, let's say your left forearm on his right shoulder blade and the basket was behind you, he knew better than anybody that I just spin off, you're done. . . . He was so strong and so cerebral and so good at making you pay for your own mistake. You had to just play him straight up and just deal with whatever comes with that, which was him going through you. It really made me toughen up." The stats aren't the things you should focus on with Reynolds. His 5.1 points and 5.6 rebounds in 24 minutes a game aren't game-changing. It's the rest of it. You saw Villanova without him as he sat for five games recently with a rib injury, the puzzle didn't quite fit, beyond missing his minutes. A guy who can think for himself, even about what kind of water he drinks, adds premium value. Villanova teammate Eric Paschall walked by. Reynolds said he's worked on Paschall about the water. "He drinks nothing but warm water," Paschall said of Reynolds. "Me - no, no." "I got Josh on board," Reynolds said, although Hart wasn't around to confirm or deny. What they all know, as March Madness begins again, it's fleeting, however it plays out this time. Of course there's urgency, even if it's only a quest for steaming water. The 40-foot by 40-foot likeness of the seniors, of Reynolds and the two others, came down after Villanova's last Wells Fargo game, replaced by a Garth Brooks banner promoting an upcoming concert inside the place.